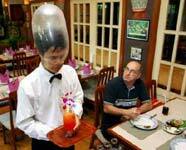 My waiter doesn't look to smart. If he can't even get a condom on right who knows what I might get instead of salad. I better keep an eye on him.